A group of six top older California-bred or sired sprinters will square off at six furlongs in Saturday’s $150,000 California Cup Sprint at Santa Anita, headed by last year’s winner Edward’s Going Left, newly turned 4-year-old Heck Yeah and leading money earner, Richard’s Boy. Most recently second, beaten 6 ¼ lengths as the 8-5 favorite in the state-bred Cary Grant Stakes going seven furlongs at Del Mar on Nov. 18, this 5-year-old Midnight Lute gelding was a respectable fourth behind repeat Breeders’ Cup Sprint winner Roy H two starts back in the Grade 1 Santa Anita Sprint Championship. Although winless in five starts since winning the Cal Cup Sprint a year ago, Edwards Going Left rates a huge chance for a repeat on Saturday with Tyler Baze back aboard. 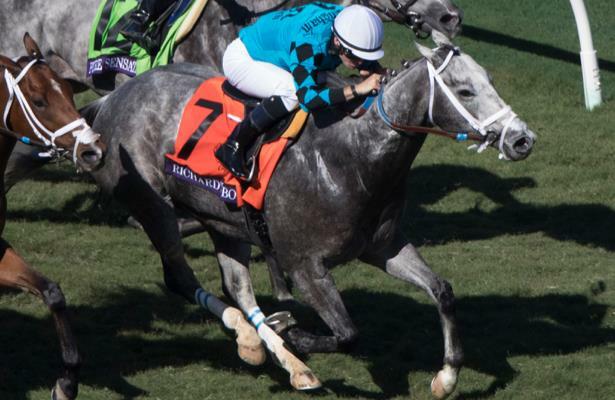 The leading money earner in the field with $947,355, this 7-year-old Idiot Proof gelding is thought to be at his best on turf, as six of his nine wins have come there. However, he comes off a big second, beaten a head by veteran St. Joe Bay in a five-furlong classified allowance Dec. 14 at Los Alamitos, earning a Cal Cup Sprint best last-out Beyer Speed figure of 99. With Flavien Prat away to ride at Gulfstream on Saturday, hot apprentice Heriberto Figueroa will ride for the first time. With two wins from five Santa Anita starts, venerable Richard’s Boy is 35-9-11-5 overall.